Britain's Got Talent winners Jules and Matisse are guilty of having deceived the British public after it was revealed that a stunt double dog was used in the final. The revalation has outraged the British public who voted to crown the duo winners of BGT 2015 only to later realise that they were conned. 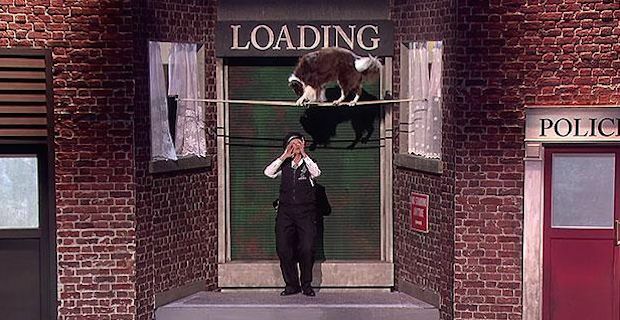 Mattise was replaced by a dog called Chase for the tightrope segment without anybody knowing this was the case. His owner Jules O'Dwyer admitted to Lorraine Kelly "Matisse is a little bit afraid of heights, so although he could officially do it, Chase is the action dog, so he plays the double for him." O'Dwyer added "Every dog has a different character. The tightrope takes months of training. Although he could physically do it, the other canine is the dog that actually did it." She also revealed that Chase had been on stage for the BGT semi-final but chose to completely omit that information when introducing the act on both nights. Fans of the show took to Twitter to express their disgust with the result with @beckyhipkiss saying "IT WAS ALL A LIE. THE MAGICIAN SHOULD HAVE WON" and @josiebarrett96 tweeting "britains got talent winners used a dog stunt double, surely they shouldn't have won then because that isn't the dog people voted for?". Jules and Matisse, as winners of BGT, walked away with the top prize of £250,000 and they will now perform at the Queen at the Royal Variety Performance. Runner-up magician Jamie Raven was behind the winners by only 2% of the vote and he can feel extremely aggrieved at the dishonest use of a stunt double.